As a thank you gift for my daughter's teacher, I crocheted this smiley pear. The pattern is from this great book which is full of adorable amigurumi projects with simple, easy to follow instructions. Bridget was so excited to give this gift to her teacher today. 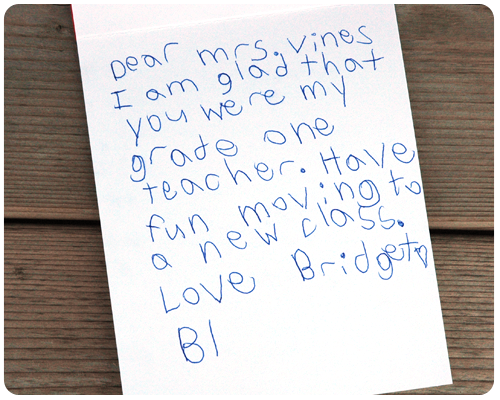 In the card that I showed you on Monday, she wrote this darling note. How sweet is that? She looked so happy and excited as she stood in line before school this morning grasping the gift for her teacher in her hand. She had an absolutely wonderful year in Grade One, and we are so thankful to her teacher for all her hard work in making that happen. 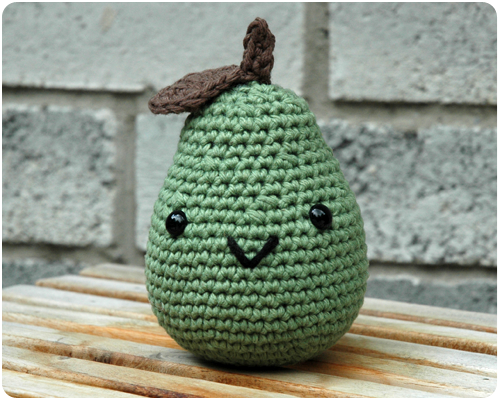 I saw your ADORABLE Smiling Crochet Pear at the Bouquet of Talent link party and had to stop over and tell you how cute it is!! The note that accompanied it was precious too! ;) Thanks for sharing! Hope you're enjoying a lovely weekend!! Thank you so much Lori. And welcome, I am glad to have you following along. Thanks so much for sharing at the Say G'day Saturday linky party. That is sweetest looking pear I've ever seen! This week's party has just started so please stop by and say g'day soon! Thank you Natasha. 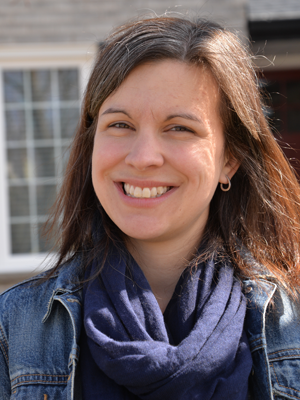 I always look forward to your link party - thanks for hosting.